Preface. S. Szymanski, Proton Tunnelling Effects in Metal Hydride NMR. N. Asakawa, T. Kameda, S. Kuroki, H. Kurosu, S. Ando, I. Ando, and A. Shoji, Structural Studies of Hydrogen-Bonded Peptides and Polypeptides by Solid State NMR. W.S. 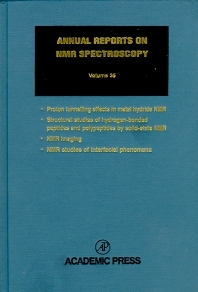 Price, NMR Imaging. J. Grandjean, NMR Studies of Interfacial Phenomena. Subject Index. Volume 35 reflects the new diverse utilization of NMR Spectroscopy, with four papers from very different areas of the field. These papers include not only recent developments in NMR but also its wide-ranging applications.